Pricing is for a case of 30 bulbs Sylvania 60 W T12 High Output Fluorescent Light Bulb - F48T12/DSGN50/HO - Description: 60W, 48"MOL, T12 HO (800 mA) rapid start fluorescent lamp, Design 50 phosphor, 5000K color temperature, 90 CRI, Average Rated Life (hr) 12000. Average Rated Life (hr) 12000, Base Recessed Double Contact Bulb T12, Manufacture Sylvania. 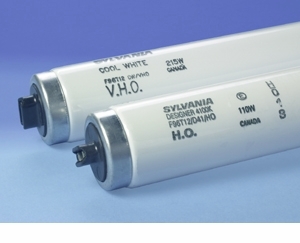 Sylvania 60 W T12 High Output Fluorescent Light Bulb - F48T12/DSGN50/HO - Description: 60W, 48"MOL, T12 HO (800 mA) rapid start fluorescent lamp, Design 50 phosphor, 5000K color temperature, 90 CRI, Average Rated Life (hr) 12000. Average Rated Life (hr) 12000, Base Recessed Double Contact Bulb T12, Manufacture Sylvania.